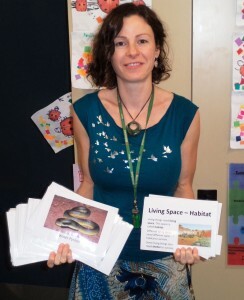 Over the course of my Bachelor of Education degree and in my placements at the Bulman Community School, NT, Methodist Ladies College, Toorak PS and Cairnlea PS in Melbourne I have designed detailed lessons and units of work, with varied activities and assessments that cater to different learning styles and mixed abilities. I have custom designed worksheets and resources that are responsive to student’s needs, content and learning objectives. 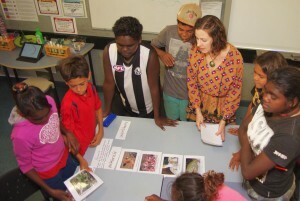 The most recent unit of work, Biology: Classification – Structure and Function of Living Things, I developed and delivered to students at Bulman School, is based on careful consideration of the Northern Territory Government MYL Science Curriculum materials. Via its learning objectives and outcomes – content, activities, tasks, experiments and assessments – it addresses all areas of Science Understanding, Science as a Human Endeavour and Science Inquiry Skills and at the same time develops all areas of general capabilities. 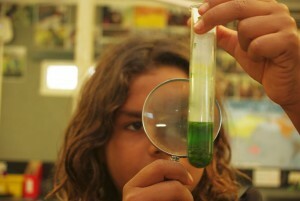 This unit utilises the power of an inquiry-based approach to teaching and learning science. 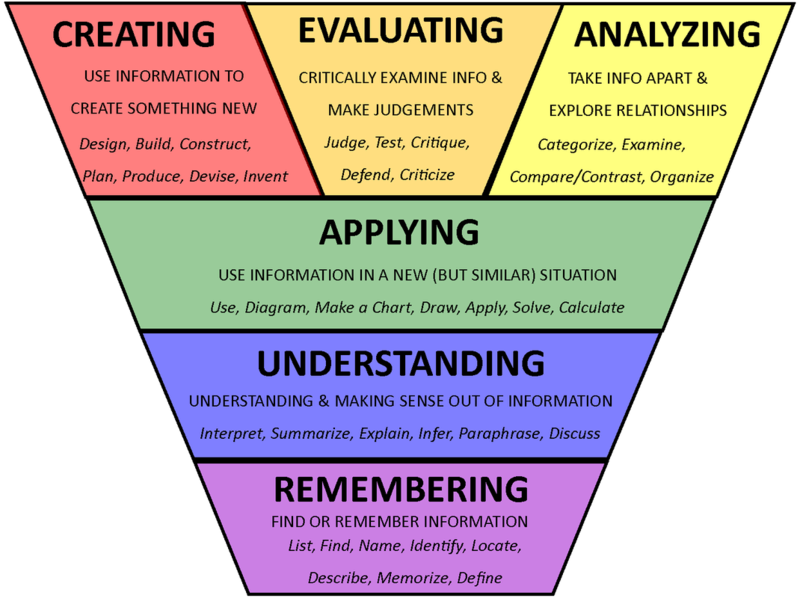 It is planned around the 5e’s Instructional Model, based on Bloom’s Taxonomy model (Bloom 1956) – encouraging complex critical though and problem solving skills through application of knowledge and comprehension via evaluating, analysing and creating. This model is interweaved in cyclical fashion throughout this unit of work; placing particular importance on its application though student centered collaborative and cooperative learning, varied activities and tasks that cater for different learning styles, through exciting experiments, open choice research activities and relevant assessments. Inquiry based learning has shown great potential in increasing intellectual engagement and fostering deep understanding through the development of a hands-on, minds-on and research-based disposition. It honours the complex, interconnected nature of knowledge construction, strives to provide opportunities for both the teacher and students to collaboratively build test and reflect on their learning (Madhuri et al. 2012). The unit allows for learner differentiation through its experiential collaborative-cooperative focus. Students worked work in groups allowing them to experience, discover, test, discuss – learn from each other, and teach each other during the process. It allows for varied levels of personal choice with regard to assessments and activities – catering to creativity, research, discussions and application of critical thinking – engaging all senses in a rich and deep explorative dialogue with the learning content. It caters to different learning styles and allows students to take responsibility, drive their own learning at a level suitable to their strengths interests skill and abilities. 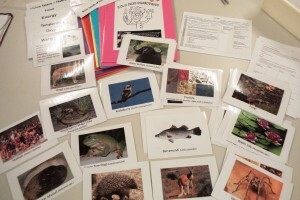 In order to cater to the specific needs of students in Bulman I researched the local flora and fauna and created picture cards to be used during collaborative and individual classroom activities – classifying and describing organisms and comparing similarities and differences in structure and function of body parts. These ensured that students could engage with the scientific content via easily relatable and familiar representations that are tactile and visually engaging. After the lesson I used these to create a wall display that continued to stimulate student interest and solidify the content taught. 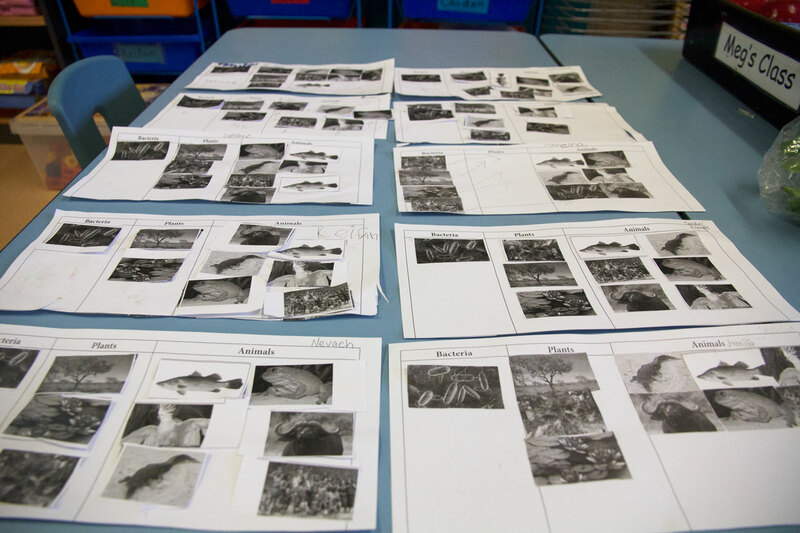 Facilitating a collaborative classification activity: students would take turns choosing a card from available pictures at random, describe the animal/plant utilising knowledge from previous lessons, and allocate the card to the appropriate group. The students would discuss the relationships, differences and similarities and between organisms of the same group as well as across the five kingdoms. The activity was interactive, engaging, fun and well received by the students. It generated substantial classroom discussions and questioning that promoted higher orders thinking. It allowed me to informally assess students' content knowledge and identify any misconceptions. Engaged through hands on practical activities and construct meaning through direct observation and experiential learning. Students work in teams to promote communication and build interpersonal skills. This was also useful for peer support - catering to students with mix skills/abilities. 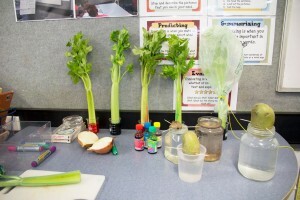 Conducting classroom experiments investigating water/nutrient transport system of plants: four groups of students, each using different food dye, would work collaboratively to set up the experiment, observe and record its progress. I (teacher) set up a separate experiment - observing transpiration in plants (where does the water go?). At the beginning of the unit of work students would split into three groups and each set up a different experiment investigating the needs and characteristics of living things: 1) growing an avocado (seed), 2) growing an onion (bulb), 3) growing a potato (tuber) - students would observe, evaluate and report to the whole class on the changes in growth and progress on weekly basis (over 6 weeks). Checking the progress of experiment – students found using a magnifying glass to observe changes particularly fun and engaging. Early Years students completing a cut and paste activity on Classification of Living Things. I felt that presenting Five Kingdoms to this age group would be confusing and unnecessary hence only three kingdoms for the little ones - Bacteria, Animals and Plants. This activity served as an assessment of learning, although informal and not graded it allowed me to give students individual feedback and correct any misconceptions they might have on the topic. Right: A display I created to support the current topics: Classification - Needs of Living Things. Students are using an iPad to research the various animals and plants. I took this photo during free time. 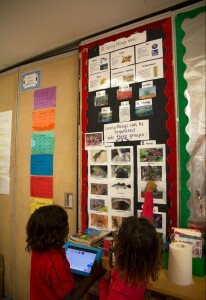 I can certainly see the importance of colourful and engaging classroom displays, particularly in the Primary setting. PoLT 1. 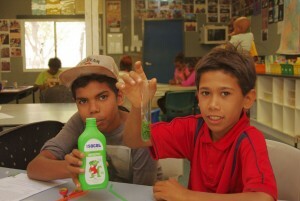 The learning environment is supportive and productive, by: building positive relationships with my students – sharing ideas, prior knowledge and experiences; promoting a culture of respect through collaborative and cooperative work in a student centred learning environment - team work based activities and experiments; utilising strategies that promote students' self confidence and willingness to take risks without the prospects of failure – the tasks were not graded, students received verbal and written feedback and were praised for effort and participation; promoting values of respect - sharing resources, taking turns, listening to each other whilst sharing results and celebrating success; providing structured support - worksheets, teacher support, valuing effort and providing opportunities for recognition of student work. PoLT 2. 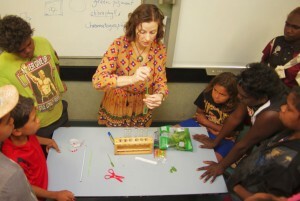 The learning environment promotes independence, interdependence and self motivation, by: using strategies that build skills of productive collaboration - team or paired activities; encouraging students to take responsibility for their learning – students were required to follow verbal and written instructions whilst completing experiments in pairs, results of which were presented to the whole class. PoLT 3. Students needs, backgrounds, perspectives and interests are reflected in the learning program, by: using teaching strategies responsive to students needs, values, interests and cultural backgrounds – lessons and resources were developed with students existing knowledge and immediate cultural and environmental elements in mind; utilising creative thinking and learning - students conducted scientific experiments, participated in classroom discussions and team activities, reflected on their learning in relation to local environmental conditions. PoLT 4. Students are challenged and supported to develop deep levels of thinking and application, by: promoting substantive classroom discussions on related topics; allowing students to work collaboratively and solo; sharing ideas and opinions, providing feedback on leaning. PoLT 5. Assessment practiced are an integral part of teaching and learning, by: providing frequent constructive feedback to support further learning; encouraging reflection and self and peer assessment. PoLT 6. 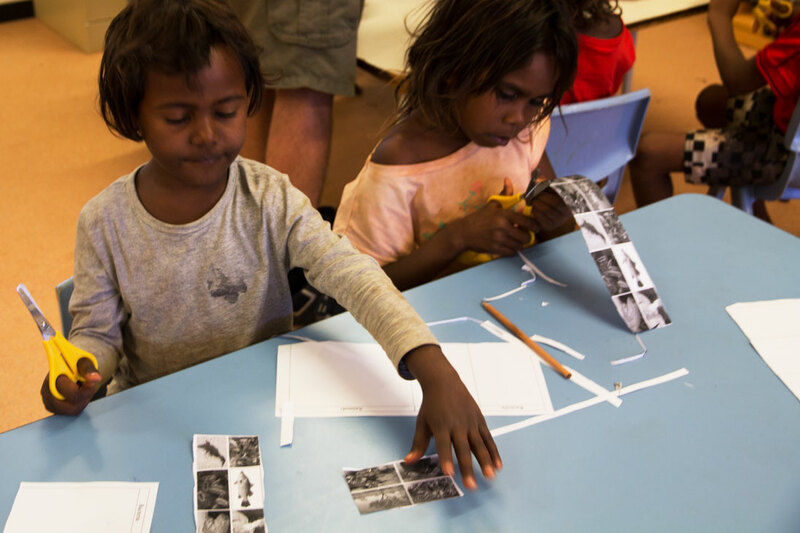 Learning connects strongly with communities and practice beyond the classroom, by: supporting students to engage with concepts relating to local knowledge and applications in community - study related directly to flora and fauna. 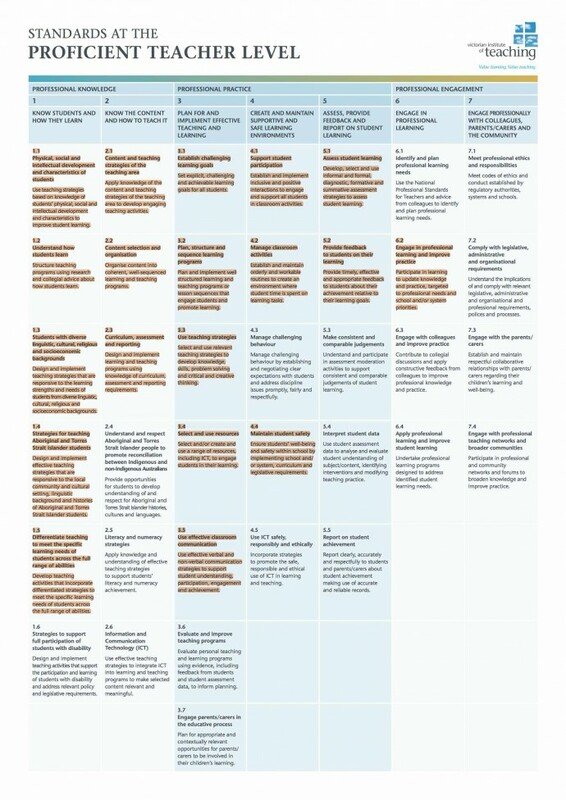 Click on the image above to view links to VIT standards related to my science lessons and unit on Classification of living things at the Bulman school, in detail. Press Esc key to exit. Mystery Animals: Custom worksheet. 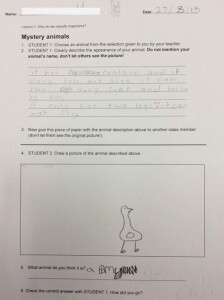 Student work sample - collaborative work. 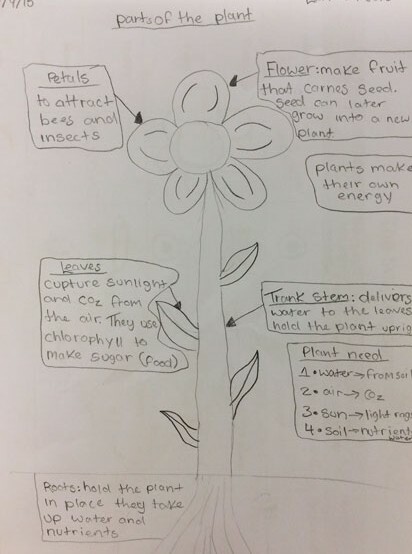 Parts of Plant: Student work sample - independent work.